"This school is our home, we think it's worth defending." Young and proud military cadets are disappointed to hear that their academy will be closing in another year. Then a tragic accident occurs in the town, and their commanding general falls ill from the shock. The board decides to close the school immediately, and the stunned cadets decide to take matters into their own hands. Major Brian Moreland (Timothy Hutton, who was nominated for a Golden Globe for the role) is in charge of his fellow cadets, and he is sure that they can occupy the school and convince the authorities it should remain open. However a series of mistakes, especially from some of the less disciplined and easily angered cadets, creates more and more tension as the stand-off continues. Moreland and some of his other officer cadets are forced to decide whether or not they can continue the stand-off and accomplish their goals or whether they should give into authorities, especially once they discover that many of the less experienced cadets are becoming frightened and want to go home. 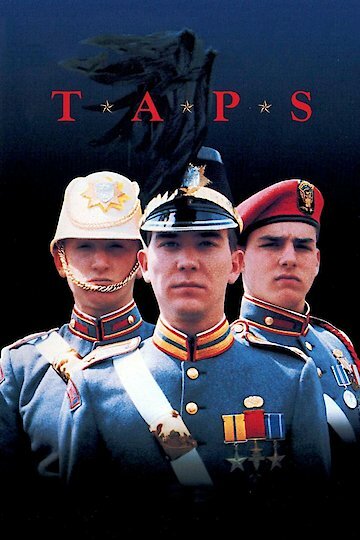 Taps is currently available to watch and stream, download, buy, rent on demand at Amazon Prime, HBO NOW, Vudu, iTunes, Amazon, Google Play, FandangoNow, YouTube VOD online.